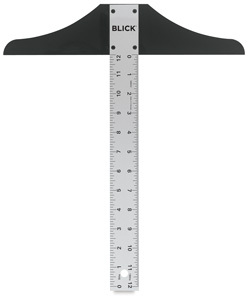 Blick Standard Aluminum T-Squares are a "must have" for drafting and art students. The extruded 1-1/2" aluminum blade is permanently calibrated in inches (1/8" and 1/16") on both edges on the front side. The ABS plastic head is lightweight and nearly indestructible. Blick Standard Aluminum T-Squares are available in six sizes.